ESP Custom Shop "Ghost Soldier". James Hetfield's Eet Fuk Guitar. Ronald David Wood is an English rock musician, songwriter, multi-instrumentalist, artist, author and radio personality best known as a member of The Rolling Stones since 1975, as well as a member of Faces and the Jeff Beck Group. The Rolling Stones are an English rock band formed in London in 1962. The first stable line-up consisted of Brian Jones (multi-instrumentalist), Mick Jagger, Keith Richards, Bill Wyman (bass), Charlie Watts (drums), and Ian Stewart (piano). Stewart was removed from the official line-up in 1963 but continued to work with the band as a contracted musician until his death in 1985. Brian Jones was the original leader of the group. The band's primary songwriters, Jagger and Richards, assumed leadership after Andrew Loog Oldham became the group's manager. Jones left the band less than a month before his death in 1969, having already been replaced by Mick Taylor, who remained until 1974. After Taylor left the band, Ronnie Wood took his place in 1975 and continues on guitar in tandem with Richards. Following Wyman's departure in 1993, Darryl Jones was contracted by the band to play bass. Since 1963, the Stones have not had a keyboardist as a member of the band, but have had long working relationships with Jack Nitzsche (1965–1971), Nicky Hopkins (1967–1982), Billy Preston (1971–1981), Ian McLagan (1978–1981), and Chuck Leavell (1982–present). ESP replacement parts were first introduced into the US in 1983 and began crafting custom instruments for local New York artists between 1984 and '85. Among these artists were Page Hamilton (Helmet), Vernon Reid (Living Colour), Vinnie Vincent and Bruce Kulick (KISS), and Ronnie Wood (The Rolling Stones). At this time, ESP also introduced the 400 Series as the first production line to be distributed in the US. Page Nye Hamilton is an American guitarist, singer, songwriter and record producer, mostly noted for his work with alternative metal band Helmet. Most of his work has been in the hard rock and alternative metal styles, though he trained in jazz guitar and has substantial connections with avant-garde music and film soundtrack composition. Vernon Alphonsus Reid is a British-born American guitarist and songwriter. Reid was the founder and primary songwriter of the rock band Living Colour, Reid was named No. 66 on Rolling Stone magazine's 2004 list of the 100 Greatest Guitarists of All Time. During this same period, ESP began making the bodies and necks for Kramer Guitars and other manufacturers were using ESP as an OEM such as Robin Guitars, Schecter Guitar Research and DiMarzio. Many traits of the Kramer line are still visible including neck construction and body bevels. ESP tooled up for Tom Anderson's shaved bolt on neck heel on the Schecter bodies and this has since become a feature of their house brand. Kramer Guitars is an American manufacturer of electric guitars and basses. Kramer produced aluminum-necked electric guitars and basses in the 1970s and wooden-necked guitars catering to hard rock and heavy metal musicians in the 1980s; Kramer is currently a division of Gibson Guitar Corporation. An original equipment manufacturer (OEM) is a company that produces parts and equipment that may be marketed by another manufacturer. For example, Foxconn, a Taiwanese electronics contract manufacturing company, which produces a variety of parts and equipment for companies such as Apple Inc., Dell, Google, Huawei, Nintendo, Xiaomi, etc., is the largest OEM company in the world by both scale and revenue. Robin Guitars is a boutique guitar manufacturer located in Houston, Texas. 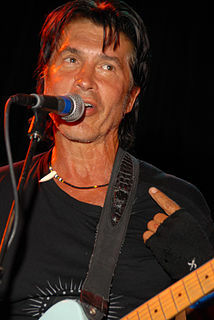 George Lynch is an American hard rock guitarist and songwriter. Lynch is best known for his work with heavy metal band Dokken and his post-Dokken solo band, Lynch Mob. Lynch is considered to be one of the most influential and famous 1980s metal guitarists. He is known for his unique playing style and sound. He is ranked #68 on "100 Greatest Guitarists Of All Time" by Guitar World magazine and is also ranked #10 on "Top 10 Metal Guitarists Of All Time" by Gibson. 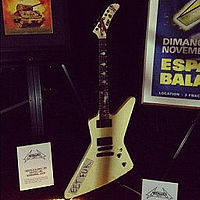 ESP Kamikaze is a guitar model distributed by ESP. Between 1990 and 1992, ESP expanded its Signature Series as well as its standard product line. The US replacement parts business was discontinued in order to focus solely on their guitar and bass line, as well as the Custom Shop series. [ citation needed ] There are about 41 signature series guitars. In 2002, ESP was ranked among the music industry's fastest growing companies. [ citation needed ] This is largely due to the Fender buyout of Jackson Guitars, who ESP had struggled to compete with throughout the 1980s and 1990s. 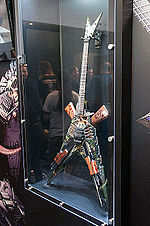 After the buyout, many Jackson endorsers switched over to ESP (this has ignited a feud between players, with Jackson players pointing out that ESP became known for copying popular instruments, including Jackson's Soloist and Gibson's Explorer models famously used by Jeff Hanneman and James Hetfield respectively, while ESP players cite the Fender buyout as casting a shadow on Jackson's metal image and hail ESP as the new king). [ citation needed ] Some of these artists who left Jackson for ESP included Dave Mustaine (Megadeth, now using Dean Guitars, who at one point had expressed interest in buying out Jackson himself), as well as Adam Darski (Behemoth), Alexi Laiho and Roope Latvala (Children of Bodom), Jeff Hanneman (Slayer), Galder and Silenoz (Dimmu Borgir). In 1996, ESP started LTD series. These guitars are similar to lower-end ESP guitars, but are more affordable and cater mainly for markets outside Japan. The 1000 series LTDs are made on an assembly line in Korea whereas the 401 series and below are made in Indonesia. 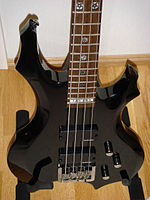 LTD basses, including the B-204 and others are beginners instruments and intermediate models were manufactured in Korea in the early 2000s (decade). The quality from the early Korea examples (and those since) has led to continued demand for the LTD series. The Custom Shop and Original Series ESPs are handcrafted in Japan while the Standard Series ESPs are factory made in Japan. Additionally, ESP has two separate Japan-only lines of guitars, the Grassroots (lower end) and Edwards (Mid-range). The Grassroots line is manufactured in Korea and are the equivalent or better than the Sub-400 series LTDs and can be considered a budget line. The Edwards guitars, on the other hand, are made in Japan and boast similar hardware as their higher-end ESP counterparts but are not handcrafted. In terms of quality, in contrast to the USA lines (i.e. ESP Standard & LTD), the Edwards line generally lies in between the more upmarket LTDs and ESP Standards. ESP guitars cater for a wide range of players. There are a variety of models including Superstrat guitars, Les Paul-styled guitars, Flying V-styled, Star-styled and others. ESP technically has two lines, one for USA and Japan, but there are slight differences. The ESP USA line doesn't include the Strat-like Snapper, the Forest GT, as well as some of the Japanese rock artist models but their custom line has been known to produce some of the most unusual designs such as a Gundam Beam-rifle replica guitar, as well as the "ESP Machinegun" used, by the Japanese band Alfee. ESP does not only make guitars, but they also produce parts, such as ESP Labs Pickups, the ESP Flicker tremolo, as well as sustainers, equalizers, etc., however, these are mainly for OEM use and not available to the ordinary customer. Dependent of target market (i.e. Asia, US, Europe) and brand (ESP, LTD or Xtone), various models are organized in marketing series. The ESP Original series has three other lines of guitars, the Edwards, Grassroots and Navigator series and are largely based on these models as well as some ESP Standard series Models. ESP Edwards Series produces mid-to-high range guitars, at a quality near the ESP Standard series, whilst ESP Grass Roots Series cater towards a more value-oriented segment of the market and are more akin to the 200s series of LTDs, however these can vary. The ESP Navigator Series on the other hand is a line which produces replicas of Gibson and Fender guitars and basses. ESP USA features the ESP Standard line (which was replaced in 2014 by E-II), as well as the lower end LTD and Xtone series. ESP USA's standard series generally caters more towards to metal players, with characteristics such as active pickups. Another line of guitars, called LTD Elite, was introduced in 2013 for overseas markets, as the ESP Standard line was slowly being phased out. LTD Elite guitars are made in Japan, boasting the same high end features as ESP Standard. Due to negative public reaction, LTD Elite was once again renamed as E-II in 2014. The ESP Standard line had been completely discontinued by this time. E-II guitars initially resembled several Edwards designs, however in 2015 many new models and finishes not available to Edwards were released. In 2016, E-II receives many new and first-time models, including Eclipse guitars with a sculpted neck joint similar to Gibson's Axcess heel to improve playability. According to ESP, E-II is the direct successor to ESP Standard with no difference between the two except the name. ESP also build custom guitars and basses, made to the specifications of the customer and the quality of such custom guitars exceed that of the Original series. These can be ordered from ESP USA but they are made in Japan. Generally speaking custom guitars cost as much, or even more than Navigators depending on the choices of the consumer and are considered to cater for the top-end of the market. There is flexibility with the orders, as the guitars produced, do not have to be based on existing lines of guitars and basses. The ESP Artist, or Signature series guitars are basically mass-produced versions of artist's personal guitars and basses. The quality of the ESP Artist/Signature models lie between Navigator/Custom Shop and the ESP Original series. Also, there exists the Edwards, Grassroots and LTD artist models and these models lie in the higher-end segments of the respective lines of guitars and basses. Ibanez is a Japanese guitar brand owned by Hoshino Gakki. Based in Nagoya, Aichi, Japan, Hoshino Gakki were one of the first Japanese musical instrument companies to gain a significant foothold in import guitar sales in the United States and Europe, as well as the first brand of guitars to mass-produce the seven-string guitar and eight-string guitar. Ibanez manufactures effects, accessories, amps, and instruments in Japan, China, Indonesia and in the United States. As of 2017 they marketed nearly 165 models of bass guitar, 130 acoustic guitars, and more than 300 electric guitars. The baritone guitar is a guitar with a longer scale length, typically a larger body, and heavier internal bracing, so it can be tuned to a lower pitch. Gretsch, Fender, Gibson, Ibanez, ESP Guitars, PRS Guitars, Music Man, Danelectro, Schecter, Jerry Jones Guitars, Burns London and many other companies have produced electric baritone guitars since the 1960s, although always in small numbers due to low popularity. Tacoma, Santa Cruz, Taylor, Martin, Alvarez Guitars and others have made acoustic baritone guitars. EMG, Inc. is the current legal name of a company based in Santa Rosa, California that manufactures guitar pickups and EQ accessories. Among guitar and bass accessories, the company sells active humbucker pickups, such as the EMG 81, the EMG 85, the EMG 60, and the EMG 89. They also produce passive pickups such as the EMG-HZ Series, which include SRO-OC1's and SC Sets. There is also a series geared towards a more traditional and passive sound known as the X series. Kaoru is a Japanese musician, best known as the leader and one of the guitarists of the extreme metal band Dir En Grey. He has been with the group since its inception in 1997 and was previously a member of La:Sadie's. He has composed most of Dir en grey's songs. His contributions display a fair amount of variety, ranging from slow ballads such as "Zakuro" to upbeat numbers like "Jessica". He performs many solos for the band, which vary strongly in feeling and tempo, similar to his compositions. Kaoru cites X Japan guitarist hide as his biggest influence and the reason he plays guitar, saying "If I had never known him, I wouldn’t be who I am today." Revealing "Kaoru" to be his birth name in his book Dokugen (読弦), he's one of the two Dir En Grey members with a known real name, along with Shinya. Toshiya is a Japanese musician, best known as the bassist of the metal band Dir En Grey. He has been with the band since its inception in 1997, although he was not in La:Sadie's, as the other four previously had been. Unlike his fellow band members Kaoru and Die, Toshiya has only composed a handful of Dir en grey's songs, such as "Erode" and "Bottom of the Death Valley". Unsurprisingly, his compositions tend to have a distinct, bass-driven sound. Die is a Japanese musician and guitarist. He is best known as one of the guitarists of extreme metal band Dir En Grey. He has been with the band since its inception in 1997 and was previously a member of La:Sadie's and Ka･za･ri. In 2015 he announced that he will be the vocalist and guitarist for a side band, DECAYS, which released an album in 2017. Die is the second most credited composer within Dir en grey, at least up to Vulgar, at which individual credits for the music were dropped. His songs tend to be more upbeat, such as "304 Goushitsu, Hakushi no Sakura", "Wake" and "Mr.Newsman". ESP RZK Series is a line of guitars distributed by ESP. 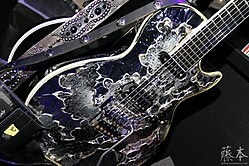 They are the custom guitars of Rammstein and Emigrate lead-guitarist Richard Z. Kruspe. The first model, the RZK-1, was produced with a custom platinum silver finish with a simplified Rammstein logo on the body of the guitar. Two new finishes, with variations in the pickguard color, were introduced at the Musikmesse Frankfurt show in early 2009. ESP produces several guitar and bass guitar models based on the custom models of several artists who endorse ESP. The star is an avant-garde body shape of solid body electric guitar, particularly favoured for heavy metal music. It blends some features of the Flying V and Gibson Explorer, both of them much older designs. The Fender Custom Shop is a division of Fender Musical Instruments Corporation, housed within their headquarters complex in Corona, Riverside County, California. The Fender Custom Shop produces special-order guitars for customers through a Custom Shop dealer network, creates limited edition high end quality guitars, builds limited edition amplifiers, and does some research & design for the parent company. Grover Jackson is a luthier. He is best known for designing and making various guitar models at Jackson Guitars, such as Jackson Randy Rhoads and Jackson Soloist during the 1980s. 9mm Parabellum Bullet is a Japanese rock band, formed in March 2004 in Yokohama. It consists of vocalist and rhythm guitarist Takuro Sugawara, guitarist and backing vocalist Yoshimitsu Taki, bassist Kazuhiko Nakamura, and drummer Chihiro Kamijo, who came up with the band's name. 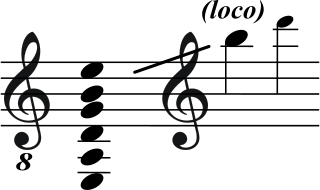 Piano pieces included in some songs are performed by Taki, while the characteristic shouts are provided by Nakamura. ↑ "ESP AND TAKAMINE ANNOUNCE PARTNERSHIP IN THE USA". espguitars.com. Retrieved 22 March 2018. ↑ "Artists - The ESP Guitar Company". www.espguitars.com. Retrieved 22 March 2018. Wikimedia Commons has media related to ESP guitars .